On Italy tours, trains are one of the best ways to see the country. You can enjoy the landscape in comfortable surrounds, be transported directly from city center to city center, and not have to work about GPS or parking laws. When you go to book Italian trains, whether online via Trenitalia or at one of the kiosks in Italian train stations (we’ll be covering how exactly to get your tickets that in our newsletter this month, sign up here), it’s easily to be either confused or overwhelmed. Italy has so many different types of trains, and often all of them travel the same route. Let’s break it down. The Italian national rail runs almost all local and regional trains. A few regions have their own systems that are also open to the public, but most trains you’ll end up taking go the Trenitalia, the national system. 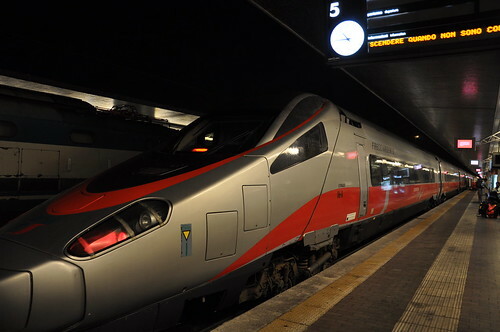 Local trains make lots of stops, only have second-class seats, and connect cities that are close by within the same region, like Florence and Siena in Tuscany or Venice and Verona in the Veneto. There are several levels of trains that go faster than local trains but slower than high speed. And every few years it seems like something new pops up! Regional trains can also connect you to cities in the same region, but they make fewer stops than local trains and move faster. You can also take regional trains or fast regional trains to move from one region to another where the high-speed trains don’t run or when you don’t want to pay the extra expense of those trains. Intercity trains were, once upon a time, the fast option, but now they are more or less phased out. You’ll still see them as a slower option on some long distance routes. Likewise, Eurostar was the high-speed option ten years ago, but now they offer another way (at twice the time and often also twice the price) to get between distant cities when the high-speed trains are full. For high-speed service, which is what you need to go between major cities such as Milan and Rome or Florence and Venice, you now have two options, thanks to the relative newcomer Italo. A private company with its own lounges and—in some cases like Rome where it leaves from a secondary station—its own stations, Italo offers a luxury product. Freccia (Italian for arrow) trains from Trenitalia have several levels of premium cabins that offer similar service, but the basic product is quite functional, if not a little cramped, and can be found for great prices if you book in advance. The Freccia trains cut the time it takes to get around Italy in half, getting you around faster than driving, and even flying in most cases. I’m getting ready to head to Italy twice next month, first to the Buy Veneto show and then for two weeks of research in Piedmont, Tuscany, and Rome. Though I’m familiar with Katie Parla’s stunning Rome app (photo above), I’ve never had a chance to look into the increasingly wide world of travel apps. But the landscape has changed significantly from the early Italian travel apps, which were little more than shrunken guidebooks. Today your phone can ask questions for you in Italian or provide a whole set of situation specific vocabulary all while offline. You can find out if the train is on time and translate menus just by snapping a picture with your phone. Some of these apps are iPhone only, but many are available for a variety of operating systems, including Android and Windows mobile.